JOHN LYONS, SR., was the first Lyons ancestor of which we have record. He was born about 1757. John’s father may have been Samuel Lyons but there is no proof of this. According to one family legend, the Lyons came from Ireland and Scotland. According to another they came to this country from Nova Scotia about the time of the American Revolution. It is not known when the first Lyons reached Louisiana. Some members of the family believe that the Lyons first settled in Georgia or Tennessee. However, it is certain that John Lyons, Sr. was in Louisiana prior to 1801 for in that year he purchased some 6000 acres of land in what is now Vermilion and Acadia Parishes. The land is situated on both the North and South sides of Bayou Queue de Tortue. MICHAEL LYONS, born about 1777. John Lyons, Sr. married Nancy or Ana, Ahart. It is thought that all of John’s children were born of this marriage; however, Michael, the eldest child, might have been by a previous marriage. According to the Lyons’ Family Bible, Nancy Ahart Lyons died on June 1, 1809, and John Lyons, Sr. died on August 23, 1835. He died at his home place on Bayou Queue de Tortue. Michael Lyons purchased a portion of the “home” place from his father, John Lyons, Sr. This property was located on the South side of the bayou; his father lived on the North side. Michael Lyons was married three times. His first wife was Mary (“Polly”) Hayes, daughter of Bosman Hayes and his wife, Martha Ivy Hayes. They were married on October 27, 1800. Mary died May 17, 1826. Michael’s second wife was Ellenor Berwick, widow of William Newman. They were married on September 10, 1828. She died March 9, 1833. No children were born of this marriage. His third wife was Susan Nolan Reeves Aikley. They were married on April 1, 1834. Michael died on October 19, 1840. His wife, Susan, died February 22, 1865. Elizabeth, born November 20, 1802, who married Edward Merriman on June 18, 1822. She died on April 7, 1834, at age 32. Fanny, born September 28, 1804, who married William Prather on August 27, 1822. Abel, born August 5, 1806, who married Ann Druzilla on Feb­ruary 13, 1827. She died on October 15, 1827, at 18 years of age. Sarah, born June 27, 1808, who married Richard West on June 22, 1824. She died on February 22, 1865. Nancy, born October 12, 1810, who married John Brien on March 6, 1827. ABORN, born October 19, 1812. Bozman, born March 20, 1815. Isaac, born April 29, 1817. Solomon, born February 27, 1819. Martha, twins, born June 10, 1824. Lyman Constantine Lyons, born March 2, 1843. Henry Bascom Lyons, born June 20, 1848. Franklin Lyons, born in April, 1851. Jefferson Aborn Lyons, born September 28, 1856. ERNEST JOHN LYONS, born April 22, 1865. Sallie Havard Lyons, who married Thomas Muldrop Logan. CHARLTON HAVARD LYONS, born at Abbeville, Louisiana, on September 3, 1894. When he was a year and a half old, his parents moved to Melville. He attended public school at Melville and after complet­ing his sophomore year at Louisiana State University, transferred to Tulane. This was in the fall of 1912. While in New Orleans, he lived in the home of his Aunt, Mrs. Sallie Havard. He received B. A. and LL. B. degrees from Tulane in 1915 and 1916, respectively. After graduation from Tulane, he was assistant principal of the High School at Glenmora, Louisiana, for one year. When the United States entered World War I, Charlton resigned his posi­tion at Glenmora and volunteered for service in the Army. He was sent to Officers’ School at Fort Root, Arkansas, but due to defective sight, was not admitted. However, he was later permitted to enter the Army for limited duty. While a student at Tulane, Charlton met Marjorie Hall. She was a student at Newcomb College, and lived with her Aunt, Mrs. Dottie McCord. Marjorie was born in Chippewa Falls, Wisconsin, on March 27, 1895. Charlton and Marjorie were married on August 28, 1917, in the original Hall cottage at Lake Chetek, Wisconsin. They then went to Pollock, Louisi­ana, where Charlton served as principal of the High School for the ensuing year. Marjorie also taught in the school, filling the place of a teacher who had resigned. She continued to teach at Pollock while Charlton was in the Army. Following his discharge from the Army at the end of World War I (1918), Charlton practiced law at Winnfield, Louisiana, with John J. Peters, Jr. Some 18 months later, he moved to Shreveport, and practiced law there for a number of years before engaging exclusively in the oil producing busi­ness. He is presently the Senior Partner of Lyons Petroleum. Marjorie Lyons is 5 “1” tall; her hair is deep, live red. She has an attrac­tive and impelling personality, is discerning and possesses rare taste. She is a brilliant conversationalist. Marjorie is well-grounded in art, literature and music. She studied book-binding at Newcomb and excelled in that craft. She possesses unusual histrionic ability, having appeared in many theatre produc­tions in Shreveport. She also appeared in a production of the Little Theatre, at Dallas, Texas. In addition to her intellectual attainments, Marjorie is a practical person. She personally supervised the rebuilding of the soil on her hill farm, Ultima Thule, near Greenwood, Louisiana. She is an excellent cook and seamstress. Her garden at 1075 Erie Street, Shreveport, was outstanding. Her present garden at 6336 Querbes Drive, Shreveport, is a gem in design and growth. Marjorie is an authority on azaleas. Marjorie and Charlton Lyons have two sons, Charlton Havard Lyons, Jr. and Hall McCord Lyons. 1. CHARLTON HAVARD LYONS, JR., born 5:30 A. M., Sunday, December 11, 1921, at 1522 Pine Street, New Orleans, at the home of Mr. and Mrs. C. T. McCord. Charlton attended public school (South Highlands) in Shreveport, later graduating from Lawrenceville, Trenton, New Jersey. He then entered Yale University, receiving a B. A. degree. In the summer of 1941, at the end of his freshman year at Yale, Charlton went to South America with the Yale Glee Club. The Glee Club sailed from New York on the SS Brazil, landing at Rio de Janeiro, Brazil. They went then by train to Sao Paulo and Santos, in Brazil, and then by boat to Montevideo, Uruguay. From that city the Glee Club went by ferry to Buenos Aires, Argentina. They then went by train into Chile and sailed from Valparaiso on the SS Santa Lucia for the United States, stopping at various South American countries enroute. The Glee Club sang in the cities named above and others in South America. Upon his graduation from Yale in May, 1943, Charlton enlisted in the Army with the rank of Corporal. He later went to Officers’ School, Fort Sill, Okla­homa, and was commissioned a Second Lieutenant on December 9, 1943, in the Field Artillery. He later went overseas with the 10th Armored Divi­sion, Seventh Army, which was commanded by General Patton. At the end of the war, Charlton was discharged as a First Lieutenant. While serving with the 10th Armored Division in Germany, Charlton had a narrow escape. He was riding in the front seat of an Army truck when a German plane fly­ing overhead, shot holes through the top of the truck just above his and the driver’s heads. Charlton and Susybelle Wilkinson were married at 8 P. M., August 12, 1944, at St. Bartholemew’s Episcopal Church, New York City. He was then stationed with the Army at Augusta, Georgia, and Susybelle was living with her parents on Long Island, her father being in Army service at that place. Susybelle was born at Schumpert Sanitarium, Shreveport, Louisiana, at 1:30 P. M., October 5, 1923. She is the daughter of W. Scott Wilkinson and Margaret West. Scott served as an officer in both World Wars, being a Colonel in World War II. He is a life-long resident of Shreveport. He is also one of Louisiana’s leading attorneys. Following the termination of World War II, Charlton entered the Law School of Tulane University, graduating in June, 1948, after two years of continuous study. He was President of the Senior Law Class. While attend­ing Tulane, Charlton and Susybelle resided at 8233 Freret Street, New Or­leans, Louisiana. After graduation from Tulane, Charlton and his family re­turned to Shreveport and he became a partner in the firm of Lyons, McCord & Logan, now Lyons Petroleum. a. Susybelle Lyons, born at Schumpert Sanitarium, Shreveport, 11:14 P. M., Saturday, August 11, 1945. Her father was in Europe with the Army at the time of her birth. On November 2, 1963, Susybelle married John Michael Gosslee, son of John M. and Mary Eileen Kleinman Gosslee. John and Susybelle now reside in Baton Rouge, Louisiana, where they are attending Louisiana State Uni­versity. b. Stafford Lyons, born at Mercy Hospital, New Orleans, 5:34 P. M., Sunday, November 17, 1946.
d. Sally Scott Lyons, born at Schumpert Sanitarium, Shreveport, 9:02 A. M., Wednesday, September 13, 1950.
e. Laurie Wilkinson Lyons, born at Schumpert Sanitarium, Shreveport, 1:33 P. M., Sunday, April 25, 1954.
f. Marian Lyons, born at Schumpert Sanitarium, Shreveport, 7:20 P. M., Monday, September 12, 1955. 2. HALL McCORD LYONS, born 7:30 P. M., Saturday, December 22, 1923, at 1075 Erie Street, Shreveport, Louisiana. Hall was named for his mother’s family and for C. T. McCord, husband of Dorothy Hall McCord. Hall attended South Highland and Southfield Grade Schools at Shreve­port, and Lawrenceville School. During World War II, Hall enlisted in the Naval Reserve and was assigned to study at Centenary College, and later, Louisiana Tech. He concluded his studies at the Naval School at North­western (Chicago) receiving his commission as Ensign. Hall was immediately assigned to duty at Leyte, Philippine Islands. Enroute to his assignment (Ernie Pyle, noted columnist also being a passenger) the plane developed engine trouble and was forced to land at Peleliu Island. When Hall reached Leyte, the small ship to which he had been assigned had already departed for the invasion of Okinawa. Hall followed on another ship but the ship to which he had been assigned was sunk in the invasion operations before he could reach it. He remained at Okinawa for eighteen months. At the War’s end, he was in command of U.S.S. L.C.T. 1326. While on Okinawa, Hall improvised materials for a duck hunt, an ac­count of which was carried in the June 1, 1946 issue of "American Field." Following the War, Hall entered L. S. U. He received a B. A. degree in January, 1949. Soon after graduation, Hall entered the oil business in San Antonio, Texas, with his father and cousin, N. Hall McCord. He later moved to Shreveport and became a member of the partnership of Lyons, McCord & Logan, now Lyons Petroleum. In 1960 Hall moved to Lafayette, Louisiana. He is now engaged in the oil producing business in Lafayette under the name of Hall M. Lyons. His father is in partnership with him. Texas, at 11:07 A. M., Friday, May 19, 1950. Texas, at 3 A. M., Friday, September 14, 1951.
port, Louisiana, at 5:45 A. M., Tuesday, January 11. 1955.
port, Louisiana, at 3:55 P. M., Saturday, January 4, 1958. *a. Troy Dominic, born at Our Lady of Lourdes Hospital, Lafayette, Louisiana, at 4:32 P. M., February 4, 1965. The publication of this family history was held up pending the birth of Troy Lyons. The printer remarked that in all his years of experience, this was the first time he had ever been instructed to "hold the press" because of the arrival of the stork. The following is data on the children of Aborn Lyons and his wife, Elizabeth Reeves Lyons, except ERNEST JOHN LYONS who has already been covered in Chapter IV, Part One. ville when a young man, to work for his uncle, Ernest John Lyons. (1.) Hyland Bryant Packard, Jr.
to Melville to live with her uncle and aunt, the Ernest J. Lyons. b. Henry Michael Walker, Jr. who married Margaret Thompson. They reside in Palomar, California. Louis Lyons, who disappeared during World War I.
Eugene Lyons, who died in infancy. 2. Thomas P. White, now deceased. He married Rena Broussard. 4. 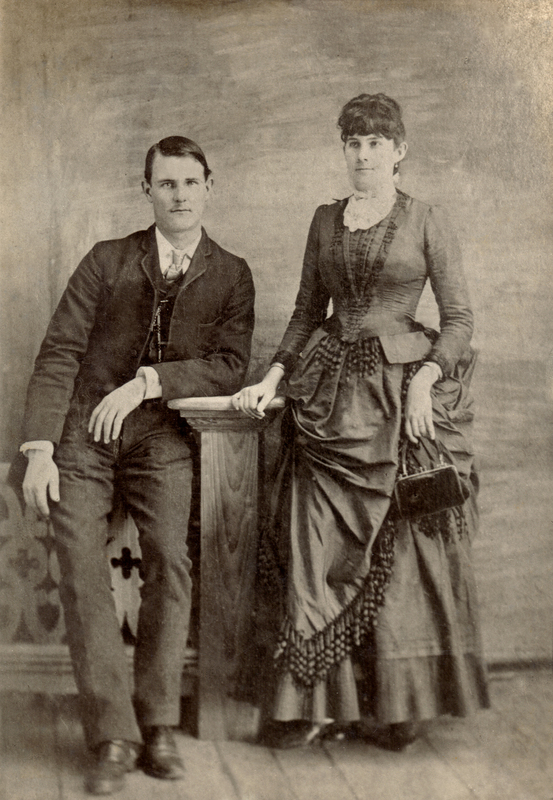 Rosa White, married T. W. R. Sampson. Rosa and T. W. R.
6. Lizzie White, married Walter C. Bier, M. D., Crowley, Louisiana. Jack B. Brooks, Congressman from Beaumont, Texas, is a grandson of Carrie I. Pipes. Edward Chastang, in Gulfport, Mississippi, on February 14, 1906. Miss Ortego, in Ville Platte, Louisiana, on November 16, 1947. Murphy on January 15, 1938. John Murphy died on July 9, 1939.
a. Harold Lamar Martin, born August 12, 1909; who married Pauline Ingram in April, 1933. They have one child: (1.) Jane Anne Martin, born November 6, 1934. Chester Talliferro Lyons, born November 25, 1895, at Abbeville. (1.) James Ferguson Harvey, Jr.
John S. Howkins, Jr. of Moss Point, Mississippi. JEFFERSON ABORN LYONS, the sixth child of Aborn and Eliza­beth Lyons, was born on September 28, 1856. He died in early youth. on January 15, 1888, and was buried at Abbeville. Texas. She married John Louis Horan on March 16, 1935. (1.) Cheryl Lynn Horan, born January 5, 1945. William Hoffman Steward, M. D., on June 29, 1946.
b. Ernest Burton White, Jr., M. D., born October 27, 1925.
a. Jo Ann White Miller, born September 21, 1929. The following is data on the children of Ernest John Lyons and his wife, Joyce Bentley Havard Lyons, except CHARLTON HAVARD LYONS, who has already been covered in Chapter IV, Part One. 1. Katharine Lyons, who died in infancy. married Beatrice Johnson, in Los Angeles, California, in May, 1935. Denice Ann Lyons, born August 10, 1964.
a. Jon Davis Lyons, born October 17, 1933.
a. George Lyons, born October 7, 1921, in Los Angeles, California. b. Aleathea Joyce, born December 23, 1925, in Shreveport, Louisi­ana, who died in infancy. Sallie and Walter McCord were later divorced. On October 14, 1933, Sallie married Thomas Muldrup Logan. They were married at the First Presbyterian Church in Shreveport, Louisiana. Tom was the son of James Henry Logan and Hannah Elizabeth Hagerman, of Richmond, Virginia. Tom was born in New York City where his father practiced law. Sallie and Tom had their home in Lake Charles, Louisiana, where Sallie resides at this time. Tom died on June 8, 1955, and was buried at Forest Park Cemetery, Shreveport. Tom and Sallie had no children but Tom adopted Sallie’s son, George. (1.) Kathryn Havard Logan, born at Schumpert Sanitarium, Shreveport, at 12:05 A. M., October 18, 1948. (2.) Lawrence Lyons Logan, born at Schumpert Sanitarium, Shreveport, at 12:20 P. M., January 29, 1951. (1.) Cheryl Ann Lyons, born August 17, 1948. (2.) Barbara Elaine Lyons, born November 15, 1951.
b. Barry Stone Lyons, born at Melville, on November 21, 1924. Barry married Marjorie Richards at Bunkie, on April 28, 1944. (1.) Susan Marjorie Lyons, born November 9, 1946. (2.) Barry Stone Lyons, Jr., born December 28, 1952.